Plants are kinda my thing. My house used to be where plants came do die, but I have come a long way and have been really working on my green thumb. You will find live plants in most rooms of my house, however, I am still a fan of an artificial plant every now and then. I especially love fake succulents. They are so adorable. 2. Put in your pebbles. 3. Place in your succulents. 4. Add your figurine + ta-da! So Sophie's nursery ... when she was first born, Skylar still lived with us and stayed in our second bedroom, and Sophie lived in our room. When Skylar moved out in December to head off to school (let's not talk about it, it's still a sensitive subject) we moved Sophie to her own room. I was so excited to decorate, I finished her room in about 2 days. There were a few things that I still needed to figure out, but for the most part it was done. After dragging my feet about posting until it was absolutely perfect (I have issues, but we can discuss that another day) I decided it was time. Plus my friend Danielle wouldn't stop bugging me about it! hahaha :) So I am so pumped to finally be sharing this with you all today! I have been wanting to share my new gallery wall for a while now. But there was something missing. And I finally got it finished. I really wanted to find a cute clock to complete my wall. Being the bargain hunter that I am. 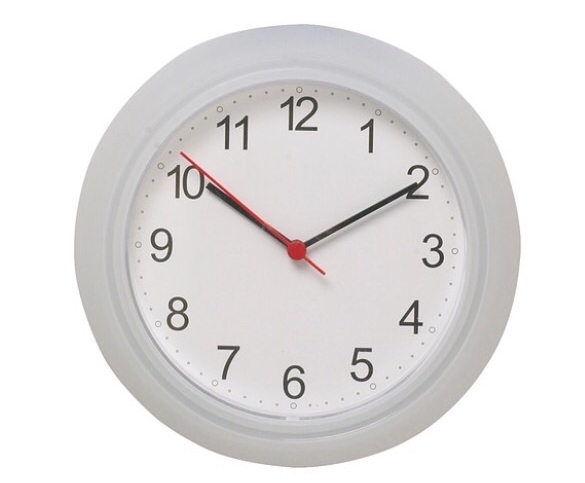 I decided to go with this $1.99 clock from IKEA. I knew that it was going to need some work to be ready for my wall, but I was up for the challenge. 1. I took the plastic cover off the front of the clock and taped off the hands. 2. Then Jake spray painted the entire thing white for me. 3. Using the plastic cover, I traced a circle on chipboard. 4. Next I cut the circle in half and made a small notch for the hands with a hole punch. 5. Lastly I taped the chipboard evenly in the clock. I like the fact that it is super clean and simple. And a fun part is that you can customize this with any color to fit your room. You can also add numbers or ticks if that would help you know what time it is. :) To accomplish the look that I was aiming for I decided to leave the numbers off. 2. Cut out the circle, but don't worry about getting it perfect! The edges won't show anyway. 3. Fold your circle in half. In the middle of the flat edge, cut a slit about 1/2 an inch deep. 5. Put the canning lid (minus the middle piece) back on the jar. 6. Then all you have to do is add money and sit it somewhere for decoration. It's cute enough to leave sitting out, so everyone can contribute! It could be for a family trip, a big family purchase, etc. It's not hard at all and only took about ten minutes! You should try it. And personalize it to your style. Throw pillows are a fun and easy way to add personality to a room. I felt like our couch was really missing something so I decided to make two really cute and simple pillows to add some color and fun texture. *These covers can be washed, but I would recommend turning them inside out and washing on a cold and gentle cycle. Then hang to dry. Print 1 copy of the hello PDF on iron transfer paper, then carefully cut around the word. Leaving about a 1/8” border around it. Place the your word in the center and face down on the pillow cover. Set your iron to the highest setting without steam. Iron the word for about 60 seconds. Make sure to pay special attention to the edges. Once the pillow cover is completely cooled, carefully peel the backing off. Stuff your pillow cover with an insert and you are good to go! To add a little extra fun to your pillow, use your yarn to make a pom pom for each corner of the pillow. (see easy tutorial here) Attach the pom poms using needle and thread. Print 1 copy of the triangle PDF on iron transfer paper, then carefully cut out as many triangles as you want to use. I cut all of them out but then eliminated some as I placed them into the pattern that I wanted. Place the triangles any way you'd like face down on the pillow cover. Set your iron to the highest setting without steam. Iron the word for about 60 seconds. Make sure to pay special attention to the edges!! To add a little extra fun to your pillow, use a decorative trim on the edges. I found this fun trim and added it to the top and bottom edges of the pillow using a hot glue gun.